January 2018 – Why that Swiss flag? Might be hard to see there, because like so many FPS games that take themselves seriously, Battlefield 1 is just a mix of browns and greens. 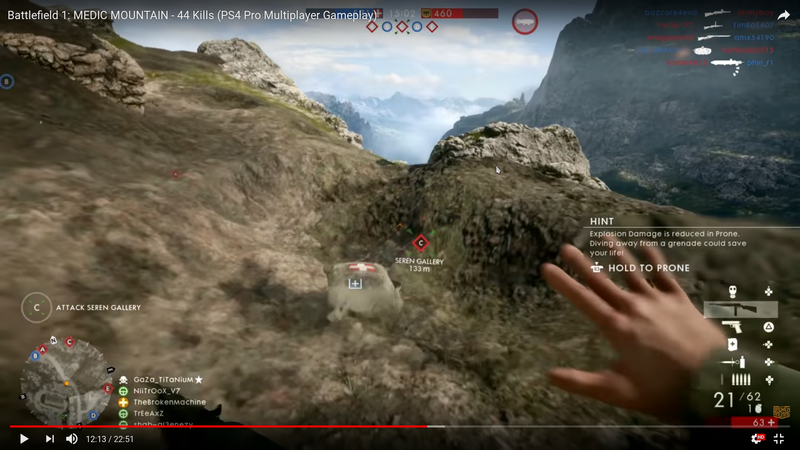 But in the screenshot you can witness YouTuber TheBrokenMachine throwing a small burlap sack of Swiss chocolates to his squad mates. Since Switzerland wasn’t part of World War 1, I guess it’s only fair for us to supply delicious truffe pralinés to the frontlines. Nothing better when you’re choking to death from poison gas than to poke your tongue through the shell and dig out that soft, sweet ganache filling. They even got the flag proportions more or less right. Very clever indeed.